Thanks for reminding me. I've seen that comment from the ranks before too. Funny and accurate ... Wonder if the Field-Marshal had a sense of humour. Many British soldiers captured in the 1918 German offensives were used as laborers just behind the front lines. A number were killed by "friendly fire"
I suspect my paternal Grandfather might have somehow missed that order. He was shot in the right eye and taken POW, on that very day. At or near to Croix du Bec , presumably on that morning. He was sent to Munsterlager lazarett and thence to Soltau POW camp for the duration of WW1. He survived WW1. 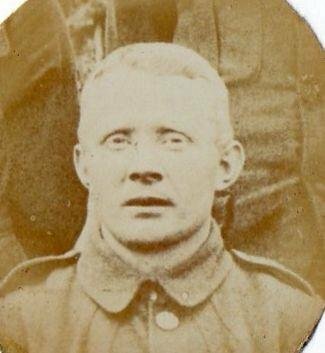 Pte John Barker , 9th Loyal North Lancashire Regiment. The 9th Loyal North Lancashire Regiment had a very difficult couple of months in April and May 1918. Approximately 1,200 men reported killed, wounded or missing. My Great Uncle was also one of them. 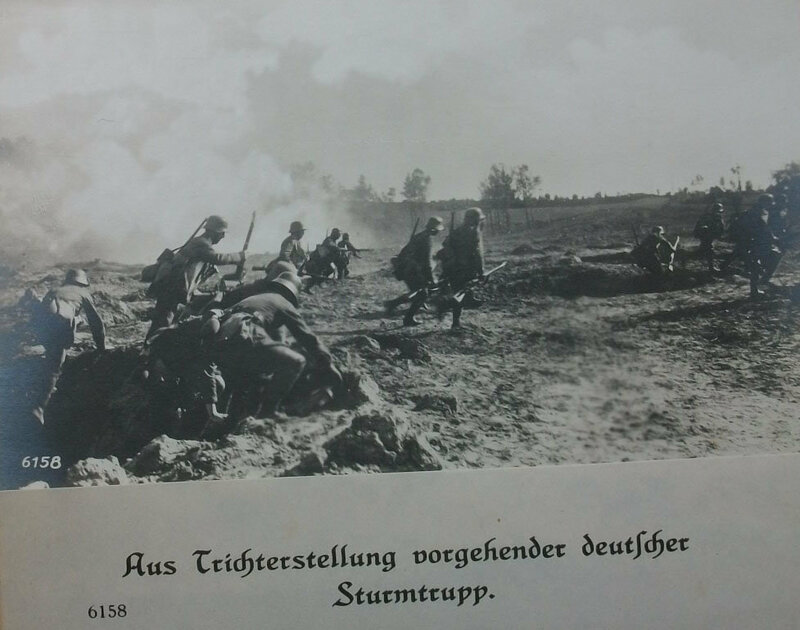 24th April 1918 - After over two weeks hard fighting the German troops were tired and had lost momentum. Nothing much of value had been taken, one prize attraction remained - Mount Kemmel a height which overlooked the ground south of Ypres and west of Lille. The French occupied the mount with 28th Division, the Germans massed 7 divisions and under the cover of fog, attacked on the 24th April. 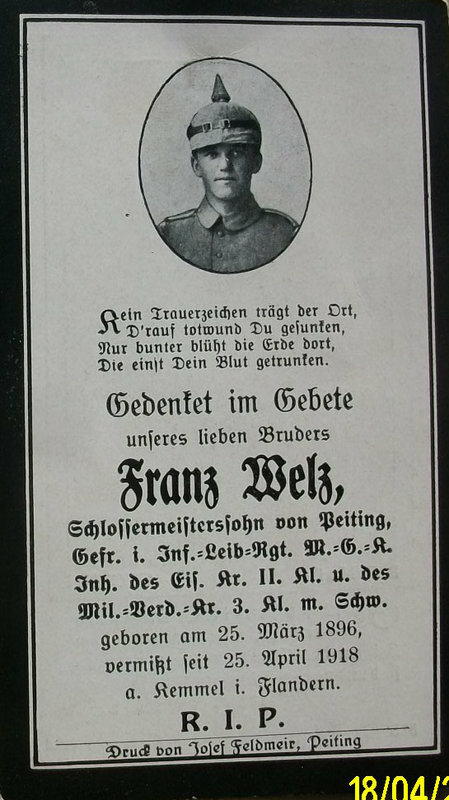 On this day, one of the causalities was "Franz Welz" a Gefreiter in Infanterie-Leib- Regiment, Maschinen Gewehr Kompanie, recipient of EK 2 & Military Verdienst Kreuz Klass 3 with Swords. His remains were not found. Hundred Years Ago Today - 29th April 1918 thirteen German Divisions attacked the whole line from Meteren to Zillebeke in the day's early hours and also struck at the Belgians north of Ypres. 30th April 1918 - The gains made by the thirteen attacking German Divisions were trivial, today hundred years ago Ludendorff ended Operation Georgette. The Allies had a nasty fright, the British still controlled the railway. The German army had causalities of over 109,000 - British Army had over 76000 causalities, the French figures were 35000 men. In manpower damage the figures were roughly equal, although the German army couldn't long term sustain such losses, especially with America starting to make it presence felt. I have two relatives who were each caught up in the German Spring Offensive in May 1918 and I thought it might be interesting to overlay their respective Battalion War Diary entries for each of the days leading up to the “big event”. The Battalions in question were the 1st Sherwood Foresters and the 9th Loyal North Lancashire Regiment. The 1/Sherwoods arrived today; the 9/LNLs arrived on May 24th. May 11th Btn HQ moved from ROUCY at 9pm to relieve 4th Btn 221st Reg Inf France as Support Battalion JUVINCOURT Section. Relief complete by 2am on 12th inst. 1st Worcester Regt in Front Line, 2nd Northants Regt in Reserve at BOUVANCOURT. A & D Coys. Attached to 25th Inf Bde near BERRY AU BAC. At this time, the 1/Sherwoods were part of the 24th Infantry Brigade, 8th Division, British IX Corps. Ultimately, the Front Line, Support and Reserve assignments for the 8th Division were as shown in the map below but during the month of May each battalion rotated through each of the 3 positions. Below is a photo of my paternal Grandfather, Pvt. Arthur Slater (#205455) in Oct 1917 when he was still attached to the 1/9th Manchester Regiment. He enlisted on October 17, 1914 when he was 18 years old and fought in Gallipoli (where he was wounded) and Egypt. In March 1917 he was deployed on the Western Front where he was seriously wounded in July 1917, and spent time in hospital in England and then Wales. On April 4, 1918 he was shipped back to France and was immediately transferred to the 1st Notts & Derby Regiment (1st Sherwood Foresters). He turned 22, on May 9, 1918 (2 days before the 1/Sherwoods arrived at PC VERDUN). He served in A Company. May 12th Raining almost all day. Quiet. Capt. W. WESTON came up at night to take charge of letters A & D Coy. Acting Captain William Weston DCM, MC appears to have been a very capable and heroic chap. 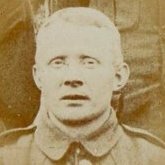 He joined the 2nd Battalion Notts & Derby regiment (Sherwood Foresters) as a private and had a Disembarkation Date of 27-9-14. By August 1916 he had been promoted to Sergeant and earned a Distinguished Conduct Medal. He was gazetted: https://www.thegazette.co.uk/London/issue/29765/supplement/9444 and the citation reads: “For conspicuous gallantry. When the entrance to a mine was blown in and several men were buried, he showed great coolness in digging them out under heavy fire. By his own efforts and fine example two of the men were rescued alive.” Regimental History gives the date as August 21st, 1916 near Mary Redan (S. of Beaumont Hamel). On January 26, 1917 he earned a commission and joined the 1st Battalion Notts & Derby regiment as a 2nd Lieutenant. While serving in this capacity he earned a Military Cross sometime in the late summer of 1917, (https://www.thegazette.co.uk/London/issue/30340/supplement/10712). By the beginning of 1918 he was a Company CO and promoted to acting Captain for the duration of his command, (https://www.thegazette.co.uk/London/issue/30558/supplement/2854). Somehow, Acting Captain William Weston DCM, MC appears to have survived the war. May 13th Quiet. During the evening there was heavy shelling on our right, South of the River AISNE. Below is a Map of the 8th Division Field Artillery positions on 26th May. But by the 13th May, the 8th Division had replaced and taken over the positions previously held by the French 71 Artillerie de Division and taken over the Command of the French Artillery that remained in this sector. To the right of PC VERDUN and South of the AISNE was Berry au Bac and the 3rd Group 203rd Regiment A.C. commanded by Capitaine PAUL. This location consisting of three, four-gun Batteries of 75mm guns. The 8th Division Headquarters Branches and Services: Commander Royal Artillery War Diary would eventually go on to record that “It is impossible to speak too highly of the magnificent Gunner spirit displayed by this Group” recounting their efforts later in the month. Thanks Chris. I tried to find a photo of him but was unsuccessful. May 15th Quiet. Very hot sun. Enemy shelled BOIS DES BOCHES during the evening. Below is a map showing the location of BOIS DES BOCHES in relation to PC VERDUN. (The map is an artillery barrage map for the 8th Division Field Artillery and also shows the 8th Battalion Machine Gun Corps dispositions as of May 26, 1918). Antwerpen Schoonselhof Communal Cemetery, Plot IIa 10. May 16th Quiet. Officers of the 2nd Northamptonshire Regt. reconnoitered the line previous to taking over. Maj EDWARDS reported to Battalion. Private O'Neill, Frank; 13612. 1st Bn. Sherwood Foresters, executed for desertion on 16/05/1918. Buried plot III. G. 6. Hermonville Military Cemetery. (WO 71/639). The Army Registers of Soldiers' Effects, 1901-1929 for Pvt. Frank O'Neill indicates that the £13 18sh 3d that he had earned before being executed by order of a Field General Court Marshall (WO 213/21) was left unissued (i.e. withheld from his family). Only three commissioned officers needed to be present for a Field General Court Marshall but the decision had to be unanimous for the death penalty to be imposed. May 17th The Battalion moved up to relieve the 1st Worcestershire Regt in the Front Line being relieved in Support by 2nd Northamptonshire Regt. Relief not complete till 3:45am on 18th. C Coy on Right, D in Centre, B on Left with A in Support. 25th Bde on our right (2nd E Lancs Regt), 23rd Bde on left (2nd Devons). May 18th Quiet day. Very hot. Although the Battalion War Diaries continue to indicate that things were quiet, the Sappers and Pioneers of the 8th Division were obviously hard at work. Below is a list of stores issued between May 14, 1918 and May 25, 1918 which includes 15,518 linear feet of boarding and 46,950 Sandbags. Much of this material was moved up via a 40cm gauge “mechanical tractor” and horse drawn tramway. Source: 8th Division Headquarters Branches and Services Commander Royal Engineers War Diary. May 19th Divisional Commander visits the lines in the morning. 8th Division: Major-General W. C. G. Heneker. No doubt the visit of the divisional CO boosted Pvt. Arthur Slater’s morale to an appropriate level. May 20th Very quiet. Heat continued. May 21st Very quiet. Patrols have been out from each front Company all night, every night, in this sector. Over to their right, on the 25th Infantry Brigade’s Front Line, the 2nd East Lancs War Diary gives a glimpse into what the 1/Sherwoods war diary entry meant. May 20th The night was quiet except for the firing in connection with the patrol under 2/Lieut. Gerrard. May 22nd Quiet. Officers of 2nd Northants Regt reconnoitered the line – which they are to take over from us. Enemy artillery rather active during night. I'd be very interested to see (get link to) a copy of the "History of the 8th North Staffords", as I am one of two running a battlefield tour from 4 - 8 June, concentrating on 1/4KSLI, which was in 56 Inf Bde as was 8 North Staffords. The three battles we are studying are: 21-26 March 1918, the Aisne (especially the counter-attack on the Montagne de Bligny on 6 June) and 56 Bde's advance from Jenlain to Taisnieres from 8 - 10 November 1918. I have a lot of information for 19 Div, 56 Bde and 4KSLI (war diaries, memoires etc) but would love to hear 8 North Staffords side of the battles. A Major Martin from the regiment appears in the KSLI's story a couple of times. May 23rd Weather thundery. Some rain in afternoon. Order received for relief on 24th. Once again, over to the 1/Sherwoods’ right, the 2nd East Lancs War Diary shows the reality of being in the front line. The previous day’s war diary entry noted just how bright the moonlight was. Can’t imagine that the patrol members were too thrilled to be sent out on a raiding party on such a night – especially if you were one of the lucky ones only armed with a club and a couple of bombs. May 23rd A fighting patrol under Lieut. C. Davies O.C. “C” Company, strength and particulars under operation orders attached, left our lines at about 2am but owing to the extremely bright moon and the extreme thickness of the enemy’s wire, were unable to progress quickly enough before dawn, and did not enter the enemy’s line. The patrol reported hostile wire as being very thick everywhere, and the mats which had been issued previously for scaling it proved entirely useless owing to their age. No casualties were incurred. I've replied to your message, Let me know you've received it OK.
Below is a photo of my Gt Uncle, 2nd Lieut. Alfred Edward Downing (#170782) in late 1917. He enlisted as a Rifleman in the 7th Kings Royal Rifle Regiment on August 11, 1914 when he was 25 years old. He was promoted through the ranks to Sergeant and subsequently fought at Ypres and the Somme (where he was severely wounded and repatriated, spending 68 days in hospital). In May 1917 he was awarded a temporary commission and after 3 ½ months training joined the 9th Loyal North Lancashire Regiment in France as a 2nd Lieutenant. By May 1918 he was a platoon commander, in D Company. May 24th Arrived at VANDEUIL, early hours of morning. At this time, the 9th Loyal North Lancashires were part of the 74th Infantry Brigade, 25th Division, British IX Corps.